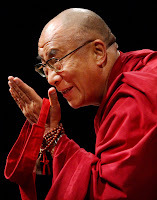 Has India finally bowed to China's objections to the Dalai Lama's visit to Arunachal Pradesh? The Tibetan spiritual leader has reportedly been asked to amend his programme by the state government. The Dalai Lama was asked to convert his public address to a religious discourse on the eve of his departure for Dirang and Bomdi La. The government had earlier cancelled the Dalai Lama's visit to a monastery in the heart of Tawang for security reasons. Arunachal officials have also denied extension requests of inner line permits to journalists, as they fear the Dalai Lama is being asked too many questions about China. Organisers of the Dalai Lama's visit have also withdrawn volunteers of the India-Tibet Friendship Society. On Sunday, the first day of the visit, these volunteers had miniature Indian and Tibetan flags on their T-shirts. But External Affairs Ministry sources have told CNN-IBN that the restrictions were imposed at a local level and that the Centre has nothing to do with it. Meanwhile, the state government on its part is also denying imposing any restrictions. Arunachal Pradesh Chief Secretary has said, "All media reports are baseless. We have not suggested anything to the Dalai Lama. He is free to move anywhere in the state. The state government is not doing any rescheduling. His itinerary remains the same." The restrictions though did not prevent thousands of his followers from gathering at Tawang. For the fourth consecutive day, the town remained closed for about six hours as almost all its residents went to attend the Tibetan leader's discourse.